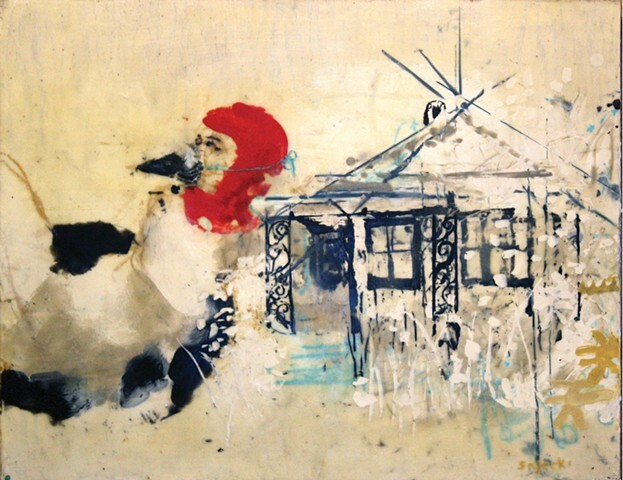 Christine Sajecki is an artist and mother living in Baltimore, Maryland. She believes in and practices the role of the artist as an active citizen, with an interest in and a responsibility to her environment. She currently serves as the board president of the Flannery O’Connor Childhood Home Foundation in Savannah, a house museum working to preserve and promote O’Connor’s history, creative legacy, and work. Sajecki's paintings have been included in many juried and solo exhibitions throughout the United States and Europe, including Haley Fine Art (Sperryville, VA), Creative Alliance (Baltimore, MD), the Edgar Allan Poe Museum (Richmond, VA), Radiator Gallery (Long Island City, NY), S.P.A.C.E Gallery (Portland, ME), Primo Piano LivinGallery (Lecce, Italy), and Galleria 9 Arte (Lisbon, Portugal). She has been a guest lecturer, teacher, or resident artist at several institutions and community centers across the east coast. Sajecki holds a BFA from the Savannah College of Art and Design in Painting.